This super-simple salad makes a delicious lunch or side dish to grilled shrimp or chicken. My husband is from Long Island, NY so we make frequent road trips there to visit his family. We have a routine that’s been perfected after almost 20 years together: leave after work to avoid the dreaded NY rush hour traffic, and then stop somewhere along the Long Island Expressway for a late-night dinner at one of those retro-vibe, 24-hour diners with menus a mile long, ginormous portions, and pie-filled glass-enclosed dessert displays. You literally can’t go more than a few miles without passing one. On our last visit, we stopped at a place that brought a bowl of marinated chickpeas to our booth to nosh on as soon as we sat down. I thought it was a strange substitute for a bread basket, but we are chickpea lovers (and we were starving) so it was surprisingly delicious. When we got home, I found myself craving that chickpea salad, so I came up with this super-easy copycat recipe. It’s perfect for a desk or picnic lunch, potluck salad, or side dish to grilled shrimp or chicken. Feel free to add feta cheese crumbles to bulk it up, if you like. As you can see, I use both extra virgin olive oil and vegetable oil to make the dressing for this salad. Sometimes the flavor of olive oil can be too strong, so I like to cut it with vegetable oil. Begin by finely dicing the red onion. Next, place the diced onions in a small bowl and cover with cold water. Let sit for 10 minutes, then drain. This step tames the bite of the raw onion, which can be overpowering (at least for raw onion-phobes like me). Combine the onions with the remaining ingredients. Toss well, then taste and adjust seasoning with more lemon, salt, and pepper, if necessary. Combine the onions with the remaining ingredients and toss well. Taste and adjust seasoning with more lemon, salt, and pepper, if necessary. Cover and refrigerate until ready to serve. Toss well before serving and adjust seasoning again, if necessary. Make-Ahead: The salad can be made and stored in a covered container in the refrigerator up to 2 days ahead of time. Note: Different brands of chickpeas contain different levels of salt, so if using a different brand than the one specified, add salt to taste. This salad is one of the staples in my fridge. i don’t temper the onions. and sometimes add more lemon juice. I’ve eaten this for breakfast, lunch and dinner. I eat it as a quick nosh before starting dinner and as a midnight snack. Thanks Jenn. Made this for a pot-luck at work, and everyone loved it! A nice vegetarian option! It was simple to prepare the night before and kept well. I like that it could sit out at room temperature and still be appetizing. This was simple and tasty. 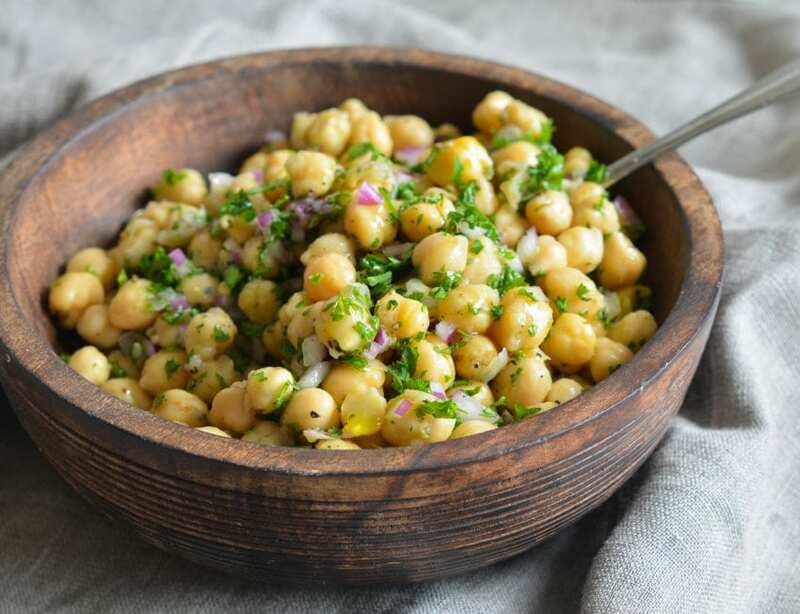 I’m always looking for ways to use chickpeas since I’m a vegetarian and always looking for variety and new ideas with beans. I liked the crunchiness of the red onion and the tanginess of the dressing, subtle and light. This is an excellent side salad or main dish. Hi Sharon, If you’d prefer to use light and regular olive oil, you can, but I find that sometimes the flavor of olive oil can be too strong, so I like to cut it with vegetable oil. Hope you enjoy! I really enjoyed this salad, I’m not sure about everyone else. The red onion flavor prevailed even after soaking. Maybe I should have upped the lemon and salt and pepper. I’ll continue to make this as a light supper for myself. Do you have a suggestion on how to make this recipe with dried chickpeas instead of canned? Thanks!! Hi Mar, You’ll just need to soak and cook the chickpeas. Here’s a good tutorial. Hope that helps! Did not expect to like this one. I loved it and could not stop eating. I did not soak the onions, love red onions. Would not change a thing. So easy and nutritious. I do not really care for hummus so I will eat this instead. Doesn’t get much easier. I loved this recipe. Easy to make, delicious and varies from the usual vegetables. Thanks, Jen. Have read the reviews suggesting the need for more seasoning. 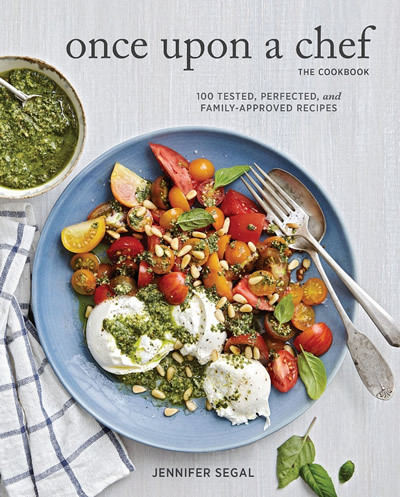 Wondering if chopped fresh oregano would be a good addition, Jen? I plan to make this soon — sounds delicious and would mix well with many other salads and vegetables. Sure, Cathy, I think fresh oregano, would be a nice addition here. Hope you enjoy! This salad was very good, but as other reviewers have mentioned, it does seem to need some kind of ‘boost’ to the seasoning. I did add crumbled feta – and that was delicious – and extra salt, but adding salt at the end never seems to work for me. It tasted lemony enough, so more lemon wasn’t an option. I would definitely make it again, but need to figure out what would make the dressing more interesting. how about some finely chopped garlic? This was a quick salad but I need to experiment with some other things to bump up flavor. Maybe feta, maybe increase lemon juice, cilantro instead of parsley……any other thoughts? Hi Janice, I think that feta and either a bit more lemon juice or lemon zest would be nice additions. You could also add a bit of ground cumin or coriander. Janice – I used cilantro and it was great! Love this salad. I’ve been adding Penzey’s Ozark seasoning instead of salt and pepper and I have a hard time stopping eating this. Jen, I understand the craving. It amazes me that this has so many calories per serving. I am making this today. The oil in this definitely boosts the calories, Karen. Hope you enjoy! I made a similar version of this salad with feta a few times. I’ll definitely try this soon! My only minor grievance is the plastic-like “shells” of the chickpea – it was a real turn-off from eating them. Is there an easy way to get rid of this without having to “peel” each one by hand? Hi Christina, Here’s an article that details a pretty easy way to skin your chickpeas. Hope you enjoy the salad! i was interested to read about this method as I’m a huge fan of Cook’s Illustrated and almost always skin my chickpeas. The method I use is just as quick, uses no extra ingredients and makes no additional washing-up. I rinse and drain the chickpeas in one of those sieves with a handle. This loosens the skins. Then, holding the sieve with one hand, I use the other hand to simply pinch off the skins and discard them into the sink. In no time at all, I have a sieve full of nicely skinned chickpeas. Good to know of another option – thanks for sharing, Davinia! I’m definitely making this in a little while. But instead of the parleys can I use cilantro? Thanks!! And congratulations on the book, its amazing! Delicious! I think this salad could be served with a lot of thngs. It’s flavourful but not so much that it clashes with other dishes. As usual, delicious! The only note that I would add is that I cook up batches of chickpeas in my Instant Pot. I had to do some ‘calculating’ to figure out the cup equivalent to a 15-oz. can drained. My best estimate is 1 1/2 cups of actual chickpeas per can. If you have a better estimate, please let me know. So good and so easy! We couldn’t stop eating it. Will be making ALL the time! My daughter actually liked it heated up in the microwave. This was really good but I definitely felt it needed more seasoning than what the recipe called for. Really simple to throw together and really healthy. I will definitely make this again! Yes I agree. I’d maybe 1-1/2 the rest of ingredients except chickpeas next time. Yum. A delicious side dish…or lunch. I’m so tired of potatoes or rice. This chickpea salad gave some real pizzaz to our steak dinner. Thanks! This was good, but I prefer a version with more veggies. I like to add red bell pepper, celery and cucumbers in addition to the onion. I also add a dash or two of hot sauce. I guess I prefer a higher veggies to chickpea ratio. This is my go-to lunch – it’s delicious if you add chopped avocado, and even some chopped arugula! My Italian family makes a similar version except it uses one can of garbanzos and one can of kidney beans. I add quite a bit more of garlic and more of sugar. And I use green onions instead. What diner? I live on Long Island and would love to go there for the chickpeas. I love getting your recipes. They are without fail delicious. Hi Jetty, I just asked my husband and he said it was Celebrity Diner in Syosset. I also add some chopped tomatoes. Delicious. This salad is delicious. I do add the addition of feta along with some toasted chopped almonds and Greek olives. If I don’t have parsley, I add cilantro. I do not care for parsley, could this be made with any other type of herb? Thank you! Sure, Kim – cilantro or dill would both be very good. Former Long Islander here. Bars were open until 4 am then you hit the diner & many times went straight to work. And when we walked home we went to the bagel store that was open. A warm bagel for the walk home at 430 am. Back to the recipe – I grew my own parsley & it really makes a difference with the chick pea salads. I also add cucumbers, no seeds. Are the nutritional values and calories per serving, or for the whole salad? Hi Sandy, It’s per serving, but the servings are large.